At first Olivia wasn’t too worried at the way she was pulled as she assumed he didn’t want to be seen in such a state but as she pulled her closer to him, her muscles tensed as she tried to squirm from his grasp. “C-captain, captain please, stop!” As he laid her down on the hardwood desk her breathing became frantic, she didn’t know what to do, he was stronger than her, far stronger, as he leant on her Olivia began to writhe and shout. Looking from his brilliant blue eyes to the window that lead out to the Deck she couldn’t see anyone who would get the Captain off her, they wouldn’t go against his word and neither would she normally, but he was drunk. Managing to raise one knee, Olivia thrusted her leg down; causing the captain to cry out in pain. Now or never! Olivia said to herself as she managed to get out of the Captain’s grasp and run to the door of the cabin and out onto deck. Panicking Olivia didn’t know where to go or what to do, everyone below deck would be mourning and not in any state to help. The sail hands however, being the brutes they are would simple laugh and toss her back in the cabin. The world became fuzzy then dimmed to black as she hit the cold deck. About five minutes later, after the captain had 'recovered' so to speak, a deck hand came bursting into his cabin 'Sir, the little miss that came out of here, she's blacked out on deck, do you want us to dump her below deck?' The captain growled at the idiotic sailor 'Out of my way.' He pushed past the deck hand and strode out into the open, a group of men were crouded around one spot. 'Al righ' you filthy animals, get back to work with ya all.' the men scattered and the captain scooped Olivia into his strong arms. 'I should let them dump you overboard you whore.' he whispered, pacing back into his quarters with the limp girl. He kicked the door shut with his foot and carried her into his bedroom. He laid her carefully onto his bed and stroked her hair from her face. His cold blue eyes stared at her. No emotion at all. He then stood himself up and staggered back into his cabin, closing the door behind him. There he collapsed on the floor with exhaustion, he pulled his headscarf off and lay in the foetal position. He soon fell asleep. Olivia slept straight through the night until the crack of dawn; it was a reflex to be awake as soon as the sun began to filter through the salt-strained windows. Her eyes opened the world still as fuzzy as the night before, it took a moment before they went into focus; though she probably wished they hadn’t. The surroundings weren’t familiar. Sitting up her heart dropped. She knew where she was. Looking around her Olivia couldn’t see the Captain. Standing up she heard light breathing to her side, crawling back over the bed she saw the captain asleep on the floor, hair ruffled, the early morning sun flickering and dancing across his tanned body. Not sure what to do she sat at the end of the bed and went to her neck as if to clutch the necklace but remembering that it wasn’t there , silent tears came again. She heard the captain stirring she wiped them away quickly and left the cabin and rushed to the kitchen to get has breakfast. In the kitchen was a broken mirror she looked at her neck whilst a few galley girls fixed up the food, she even had a tan mark where the necklace should be. Taking the food back through the galley and up on deck Olivia took every step as carefully ad she could in case she should trip. Making it back up to the Captain’s quarters she set the food down on his desk and sat on a rather simple looking chair in comparison to the rest of the room and waited for the captain to wake. The captains head was spinning when he sat up. He heard the door to the cabin close. Whether she remembered anything of the previous night he didnt know, but he cirtainly did, despite the hangover. He stood, the light becoming a bit too much. He kicked open the door to his cabin and leant against the frame, ruffling his hair. His eyes were still closed, and he yawned. Olivia jumped to the sound of the door being slammed open, she didn’t know if the captain remembered the night before but she did, it was imprinted on her mind, she knew it was the alcohol but she wasn’t sure if it was what she wanted. It wasn’t a compliment that the only man who ever looked at her than anything more than a relative was drunken blind and happened to be the man she was to serve for the rest of her days. Trying to move on from the sombre fact she watched him whilst his eyes were still closed, she watched him with admiration and confusion. As his eyes did open she stood and nodded to the food she had gotten him and not dropped, though she was sure that he was expectant of perfect presentation. Stepping away from the desk she asked what he wanted her to do. Olivia watched the cpatain , not sure what of make of his appology. Olivia knew he remembered as clearly as her. Not replying, she took the plate she had so delicately delivered and headed to the door to return it to the kitchen. She heard the smack of his forhead to the desk, turning she saw his childish self-pitty and blushed, trying hold back a smile and a small laugh. Olivia turned back to the door only to make a full circle and face the captain agian " Yes Captain? " The captains breath was shallow. He thought over what he was about to do. 'Put down the plate. And sit down.' He clenched and un clenched his fists. 'I...' He sighed loudly, he couldnt force himself to bring the words through his mouth. Instead he dissappeared through the loot. He was rummaging through barrels of gold coins, and boxes of jewlery until he found what he was looking for. A necklace he swapped a slave girl for off the coast of Italia. It was crafted with the finest gold, and inlayed with a fine disk of mother of pearl from the shores of Africa. It was one of, if not the, most beautiful peice that he owned. He picked the peice up with his delicate fingers and attached it onto a black ribbon, of which was a clasp at the back. He solomnly placed it in his clenched fist between his fingers and walked slowly back toward Olivia. He stood behind her and lowered the necklace onto her neck. He bent down, closer, and did the clasp up. He placed a hand on both of her shoulders and leant into her neck, almost caressing her ear with his mouth as he whispered, 'this is for you. To replace the other. And to apologise for the position i put you in. Sitting down on the chair Olivia looked worried , she didnt know how to his actions so for all she knew; he could come around the corner with a gun or cutlass and kill her where she stood. What she was about to recieve was far more suprising. Her grey-blue eyes widened at the sight of such a beautiful necklace. The cool touch of the fine gold sent a shiver down her spine, his lips so close made her heart race. Not sure if she would be able to get the words from her mouth , Olivia wispered " Thankyou Captain , you really didnt hav-, Thankyou..." She stood up from the chair and turned to him and gave him a small smile before picking up the plate and returning to the kitchen. 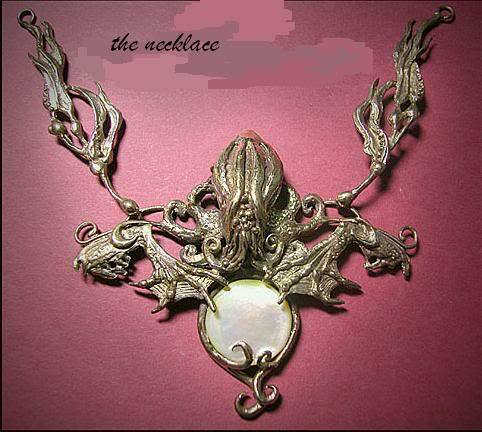 Walking through the Galley, jealous whipsers began to brew as wenches caught their eye upon the necklace. Olivia ignored them for now and returned to the Captain. Closing the cabin door behind her she stood a few foot from the door, unsure of what to do. Olivia must of jumped a mile ad the gasping man burst in with the news of land just a day's sail away.She gave the man from the crows nest a small smile, but he didn't even look her way, he was looking far too scared to even acknowledge her presence in the room. She knew the legends and rumors about the captain but to Olivia so far all of them had been false, he wasn't as cut up as the men n his crew , she couldn't comment on anything else, not yet. Her musing was interrupted by the bright face of the Captain himself. Smiling as he swung her around she didn't understand what was so exciting; as he confirmed she already knew women weren't allowed of the boat for obvious reasons. Hearing that she was going on land brought the brightest most genuine smile to her face, she had never been on land, never seen land or anything similar. Olivia ran back down to the kitchen and down another set of stairs to where all the wines and rums were kept, grabbing a bottle she ran back up on deck and passed it to the Captain and stood three paces back from him. Looking out away from the ship Olivia saw her first glimpse of land. 'Alrigh men, same drill as usual. WOMEN BEER AND GOLD!' the crew burst into uproar. The captain smiled as they pulled into a secluded cove. 'And remember, if i know that any of you scurvy dogs have been around in this ere cove for the next month, i'll have your hearts and eat them whole!' The men dropped anchor and left the ship. Captain ran down the stairs to below deck. 'WOMEN!' all the ships women gathered quickly around him. 'You are to leave into the forest and gather food for the next month. Theres a lodge about a mile into it. Sleep there. I dont want to see you in the cove. GO!' the women fled the ship on his orders. 'Right...' the captain shouldnt really be happy to see land, seeming as his soul was to sea. The real reason he was joyful, was that now, he had full reign to be himself, not wear the stupid coverups for his identity, not stay in his cabin. He had control of his ship at last. Remembering that Olivia was still there, he turned, motioning to her to follow him out onto the Deck. There, he stripped off, down to a small pair of shorts that just reached to the middle of his thigh. 'Call me Jack.' He winked at her and ran to the starbord, he breathed heavily, and took a running jump to then cartwheel to the center, Reaching the main mast, he grabed a rope, Climed up it with ease and sat on one of the boom's. The sun was beating on his back, and for one moment, he was completely content. He suddenly had and idea. Standing up on the wooden boom, he squinted to look down at Olivia 'How deep is the water? We weighed anchor pretty far out right?' He looked into the blue depths below. The boom went out further than the side of the boat... right? 'Okay...' he thought about what else to say, a boyish grin on his fac 'catch me if this goes wrong?' without giving her anytime to answer he backed up on the boom and took a running jump off the edge. He tumbled to his probable death, He curled up into a ball, clutching his knees and rolling mid air before streching out into diving position and cutting smoothly through the water. Thank god. It was deep enough. Now he was there, he thought that he might scare Olivia, his property. He let his breath leave through his mouth and sunk to the bottom. It wasnt too deep. There, he lay on the bed of sand, with his hands behind his head, and stared upwards through the crystal waters. He intended to stay down there for a while to see what she would do. Olivia was about to protest she could see where this was going but before she could even get in a word of disagreement Jack as already off the boom and in the water, for a moment she stared into the water , she couldn’t see him, only the air bubbles rising. She stood there for a little longer .beginning to worry until she decided to go in after him; a corset and full skirt would only send her sinking to the seabed. Deciding to strip down to her undergarments and dived into the water, not as cleanly as Jack had but she was only out to look for him. Swimming further down she saw him at the bottom as if he was relaxing , she didn’t have enough time to even comprehend what she had saw , she was running out of breath. Olivia swam to the surface, unimpressed with what she saw. Jakc let out his last bit of breath and swam ferrociously toward the surface, where he saw Olivia, not looking impressed. He laughed loudly, not holding back, his laugh was unbaited, like he had been waiting for something to make him laugh for thousands of years. 'Oh my!' he gasped, wiping tears from his eyes and swimming effortlessly over to Olivia 'Oh my! you jumped in! that was hilarious!' he began laughing again. His laugh was beautiful, like waves gently kissing the shore of a fine day. Olivia turned away from the Captain, not happy at all, she went to help him and all he could do was laugh. She saw that it was a trick or some sort of plan to make a fool out of her. Crossing her arms she turned away from him and muttered stormily to herself “Well I won’t jump in after you again…” With that comment Olivia began to swim back to the boat in silence. Her comment made the captain laugh even louder. Before she could get back to the boat, he caught up with her. He was a strong swimmer, learning this from spending all his life on the seas. 'Olivia! Olivia! I'm sorry...' he said, trying to be serious. He failed miserably with a giggle 'but if you'd seen your face! It was funny! Oh... Oh come on!' he exclaimed while she carried on swimming. He caught up with her, only to launch himself onto her, dragging her underneath the warm waters by her waist and spinning her round to face him. He looked at her face. His eyes searching every plain. Finally he let her go, to rise to the top. He stayed under. Contemplating what he saw. She was only wearing her undergarments, which were now soaked. She was almost... naked. Olivia ignored his comments and his attempts to get her to stay, she paused for a moment, listening to his enchanting voice. She almost stayed in the warm water if only to listen to him again but she was trying to make a point. Olivia continued to swim towards the boat but before she could so much as touch the bloody heart she was taken down under the water; being spun around she looked at the captain directly in the eyes, his matching the water so perfectly; he must be at one with the sea... She thought to herself before rising to the surface. Olivia continued to the boat and climbed back on deck where here undergarments began to dry quickly in the mid day heat. The captain, after pausing under the water to what seemed a lifetime, rose to the surface and followed the girl, climing up the rope ladder huing lazily over the side of the huge ship. Porte rico, he'd been there before. On the main land there were many women and taverns that he used to check into. The water was so warm, and so clear, Warm and inviting. It was almost a shame to get back out again. He sat on the side of the boat, watching Olivia. Her skin sparkling in the mid-day sun. 'Dont you feel the least bit embarressed?' he asked her, his head tilted to one side and his feet swinging over the side. She might not have noticed him, because she jumped when he spoke. The sun was so warm, it felt good to be on the surface of the boat instead of the cramped, damp and hot quarters below. She pushed her sun bleached hair from her face and stood in the middle of the deck her underclothes nearly dry. She didn't realize the captain come back on board of the boat consiquently olivia jumped a mile when the captian spoke. Jack grinned. Feisty one. He wondered how many men had tried and suceeded with her. He looked at her pale skin, she cant of been out in the open very often. How did she learn to swim? He decided to have a bit more fun with her. 'What did you say to me? Do you have any idea of whom you are talking to?' he said in a malicious whisper. 'I take you into my care, getting youout of below deck, and this is how you speak to me? I should run you through.' he waited for her response. Olivia was from below deck, true but it didnt make her dull or stupid , she knew how to write, read ( just about.) but also judge peoples character very well. She could tell what the Captan was up to; she could see a slight smirk in the corner of his mouth. So, Olivia played along. She threw herself to her knees infront of him " Im so sorry captain, please forgive me!" Grabbing on to the edge of his shorts " I behave i promise!!" Now fully dried she walked to her clothed and began to re-lace her corset. 'You dirty mare!' he exclaimed, seeing that she was toying with him. He wasnt finished yet however, tip toeing up behind her and snatching her corset out from her hands. he held it up high above his head so she couldnt reach, then ran up the stairs to the helm still grasping the item of clothing. He held it up to the light and inspected the holes in the tatty, faded green garment. He noticed how small it was too, and the threading was fringing. The lace was falling apart. 'Do you have no others?' He asked loudly, calling across the deck. It cirtainly looked like it was the only one she owned, and she didnt have any other oppertunities to get new ones, and no gold to do so either. It was awfully made, and something he wouldnt expect to dress slaves in let alone any of the people on his ship. Her hair was a mess too. Not like the porto rican women. They were always finely groomed, deep black or dark brown hair and tanned skin. Beautiful curved bodies. He thought back to his last visit. So many women in just one month. It made his mouth water just to think of it. He may have looked young, but he cirtainly wasnt short of a good time. He thought back to Olivia, the girl he had only been aware of for a short time. Her countenance intruiged him, there was something differant about her that he hadnt seen in any of the other women. He didnt quite know what it was, but he was going to find out. He found himself wondering about how many of the men on the ship that had had her in their beds. It annoied him for some reason, to think of her as some kind of whore. Most of the women he hiredn wwere whoresand plunderers, rescued from hanging only to be confined in something much worse than death, a ship under his rule. 'Olivia.' he demanded, changing his tone from playful back to what was expected of him 'follow me. Now! Hurry up wench!' He made his way toward his cabin once more.